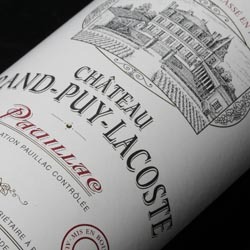 Join us on Monday, January 23rd from 5 pm to 8 pm at our Store, for a tasting of two Pauillac Fifth Growths: Château Grand-Puy-Lacoste 2008 and Château Haut-Batailley 2002 conducted by Emeline Borie. [quote]”This estate counts up to 90 hectares of land out of which 55 are dedicated to vine, with a little reserve of land of 2 or 3 hectares that will be planted in the coming years. Our domain remains exceptional, thanks to its location, as its terroir is held all in one piece, with the exact same cadastral layout as when it was classified back in 1855.” – François-Xavier Borie, Owner, Grand-Puy-Lacoste and Haut-Batailley. [/quote] Click here to watch the full Interview with François-Xavier Borie.